The fresh air hits your lungs, your chest convulses and you spew in an idyllic sylvan setting. What could be nicer? And no missing the bowl when there’s no bowl, unless you’ve got a birdbath. Does require some after-swilling. An absolute cold-porcelain classic, with or without optional fluorescent lighting, and the least likely to need cleaning. Though it will need cleaning, and that cleaning will be horrible, especially as cleaning toilets is an unpleasant job to begin with. Remember that time when you were sick on platform 11 of Manchester Piccadilly station? Or when you threw up in a bin in front of that bus queue? Or when you chucked down a spiral staircase in Amsterdam? What happened next? You walked off and it wasn’t your problem. Riding the Vomit Rooster long-term through illness? Treat housemates to the sight of you relaxedly retching into a bowl while watching Judge Rinder. Extra cool points if you’ve got a family and it’s the kids’ pink plastic sick bowl. There’s something delightfully primal about eschewing all mod cons and niceties and just losing it in any random meeting of walls. Makes you realise maybe we’re not all so different, after all. A robust, though problematic, choice. Ideally placed in terms of height, scrubbable, easy-to-rinse, but just too near to food preparation areas for any errors to be less than catastrophic. Epidemiologists recommend anywhere else. Everywhere’s wipe-clean, and there’s wi-fi. 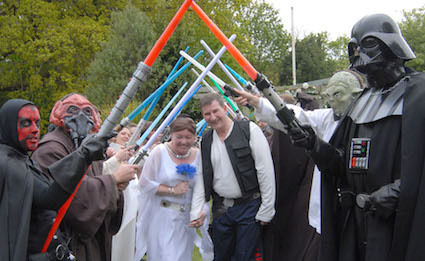 THE mating season for nerds has begun early with the release of the new Star Wars trailer. Nerd mating usually starts at the beginning of June at the Download Festival, but the new trailer has left them unable to contain their desires. Sci-fi fan Mary Fisher said: “I just had to message my husband and say ‘Meet me in the Dagobah System in 30 minutes’. “And my boss at the IT company I work for just said ‘May the force be with you’ with a knowing wink and a smile’.